The Mistral is, without a doubt, one of the most beautiful machine’s I have ever seen. It is the icon and centerpiece of the Octagon and something I revere. I have worked on several machines and perhaps because I use it every day, it has become my favorite. La Mistral is elegant, striking, powerful, efficient, precise, simple, and dependable. 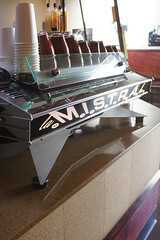 Our particular machine was the first La Mistral to be in a commercial shop in California. Rumor has it, it is also one of the first in America. Our’s was custom made for our store, hense why there are three group heads (it now comes with three as an option but at the time we had our machine fitted with a third) with a funny set of two buttons on the left side. 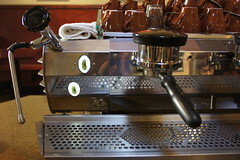 The left steam wand has also been replaced with a more powerful one. 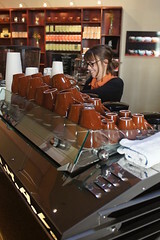 It is an older machine and nowadays the Strada and Sysnesso products take center-stage in most shops. 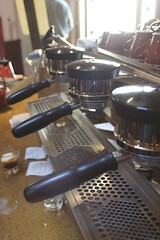 I guess, in a way, the Mistral is kind of in the limelight, bowing out of the show as a veteran of top-of-the-line espresso machinery and being replaced by more technically sophisticated models. Tech wise, it was advanced for the time; dual boilers, pre infusion, P.I.D. systems, and ours have bottomless LM porta-filters. It is automated and while it may seem simple, we have a lot of control over the bridled power of La Mitral. 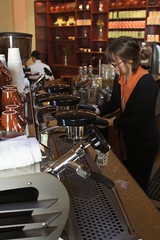 We know how our preinfusion is set, how different coffees will pull, how best to utilize our steam wands, etc. What is more important to me is how it feels when I use it. The Mistral is like a stallion; gorgeous and powerful. When I am at the reigns, I feel like I have complete control over my craft. From start to finish, the machine is incredibly smooth and consistent in it’s delivery; the steam wands are very efficient and can quickly stretch very smooth milk and the preinfusion system always produces top quality shots. When I have worked on other machines, there sometimes seems to be two very seperate processes going on at all times; the steaming and the shots. Take the Hydra, for instance. The beautiful digital displays and paddle system is so fun I could spend hours just doing that part. The steam wands themselves feel like an entirely separate task that also seems to have been less focused by comparison during the engineering process. The Mistral is different, it is as if every part of the system was designed very much with the idea that drink making is a single, harmonious amalgamation of the two processes. I pull my shots, watch them go, start steaming my milk, and can easily maintain both jobs without taking my focus away from either. Hard to explain, I guess you will just have to see it to believe it. The most striking feature, without a doubt, is the design. 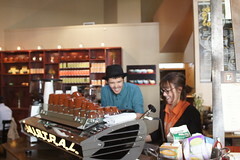 Many people have literally gawked at our machine and commented on it’s flawless style. It looks good, that is all I will say; it looks like it feels. 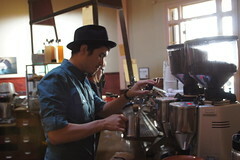 Coffee is, in some ways, an art form. The Mistral is a testiment to that school of thought. It stands out as an icon on our bar and exudes excellence. While the Strada may be technically superior, think of the Mistral as that eternally beautiful Straavarious (funny coincidence?) 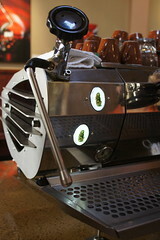 that will stand the test of time as a beautiful instrument of coffee. 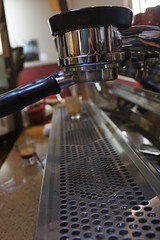 Thank you La Marzocco for such an amazing product. 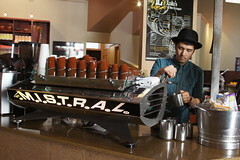 Though it may be past it’s prime in terms of technology, no one can deny that La Mistral is a top of the line, gorgeous piece of coffee engineering. Much love. Hey friend, not sure what you mean, wish I could help.